This entry was posted on March 22, 2018 by Admin Account. Every September, Apple comes out with new iPhones for a public that still can't get enough of them. Each year, lines form around the block in front of Apple Stores days in advance of the official release. The real question, of course, is should you be in that line too? Is the new iPhone for 2018 worth the hassle of an upgrade? Or would it be a better idea to wait another year? It's never too early to start planning a major purchase like this, so here are three reasons to buy (and two reasons to hold off on buying) the new iPhone in 2018. The iPhone brand has a value all its own, and there's something to be said about owning the coolest new smartphone on the market. As an iPhone, the new model comes into the world with an OS that's compatible with hundreds of thousands of apps of every kind. But What Kind of Device Will It Be? That said, Apple has been playing its 2018 iPhone release close to the vest. Rumors have gone around that the 2018 model will just be one new phone — a successor to the iPhone 8. But there's also talk about two phones, one with a humdrum LCD screen and another with a jazzy new OLED screen. It's also possible Apple will again offer a high-end and budget model aimed at different markets. What's more, they're all expected to hit the market within weeks of each other in September 2018. Until at least some of the details are confirmed, you can't even be sure what you're getting. Something is brewing with the 2018 iPhone's battery pack. Prior to the release of tech specs, it's rumored that the new model has two lithium-ion cells linked in an L-pattern with a capacity of 3300-3400mAh. That's around 25-percent greater capacity than current iPhones, and it's substantially higher even than the 2018 LCD smartphone models with rectangular batteries, which clock in at the 2850-2950 mAh range. Extra Battery Power Might Not Mean Extra Battery Life. . .
That extra battery power is going to be necessary. If the 2018 iPhone is indeed offered with the OLED screen (which is likely, as Apple has doubled its standing order for the screens from manufacturer Samsung) then power becomes an issue. While an OLED officially consumes up to 40-percent less power than an LCD, that's for a predominantly black display. Mostly-white displays (such as text pages and most websites) drain power faster. The 25-percent bonus in battery capacity might be canceled out by this one factor alone. The 2018 iPhones are all apparently getting massive upgrades to their cameras. The premium iPhone is expected to have new TrueDepth 3D scanners for augmented reality and facial recognition. 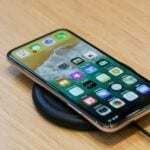 Unlike the 3D scanners in the 2017 Android phones, which send out 30,000 tiny laser dots in a grid pattern and measure the distortion to get a three-dimensional picture of the world, the 2018 iPhones may come with a true LIDAR system. Those measure the return time of the light beams instead of measuring distortions. This is effectively optical radar, and it has the potential to produce "super-resolution" pictures at something like DSLR quality. If true, this may mean the new iPhones are finally good enough to replace digital cameras altogether.